For my 500 km solo hike along the crest of Brooks Range in Alaska, I will need a lot of gear. However, the gear will not need to be as heavy as some might expect. 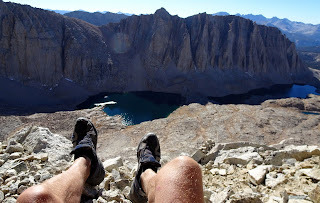 Will I be able to abide by my 343 rule; that the collective weight of the three big ones (shelter, pack and sleep system) will not exceed 3 kilos/7 pounds? As most lightpackers know, if you keep the weight of the three big ones down, you need not do much more. These are the heavy items where the average backpacker can save a lot of kilos. Way more useful to focus on this than cutting toothbrush handles and clipping offending inches of straps or washing instructions on your clothing. A number of years ago Martin and I coined the '3 for 3' rule here at Fjaderlatt, which is explained here. My own average for long hikes in Scandinavian mountains north of the Arctic Circle and above timberline has for a number of years been about 2,2 kilos for the three big ones. These big ones have usually been a Golite Jam (old version weighing slightly over 600 grams) or Gossamer Gear Mariposa Plus pack. My favourite shelter (especially for protected areas but I have used it during a 500 km hike through Swedish mountains) has been the Gossamer Gear The One tipping the scales just below 500 grams. And for many years (soon to be retired?) my sleeping bag has been a Marmot Hydrogen down bag rated at -1C and weighing 685 grams. Underneath this bag I have in recent years used a Thermarest Neoair XL Small (210 grams) and a full length Laufbursche UL mat weighing 150 grams. Some things don't change, and in this case this goes for my sleeping gear. Hydrogen, Neoair and Laufbursche will be my companions on the Alaskan tundra. The biggest difference will be my pack. 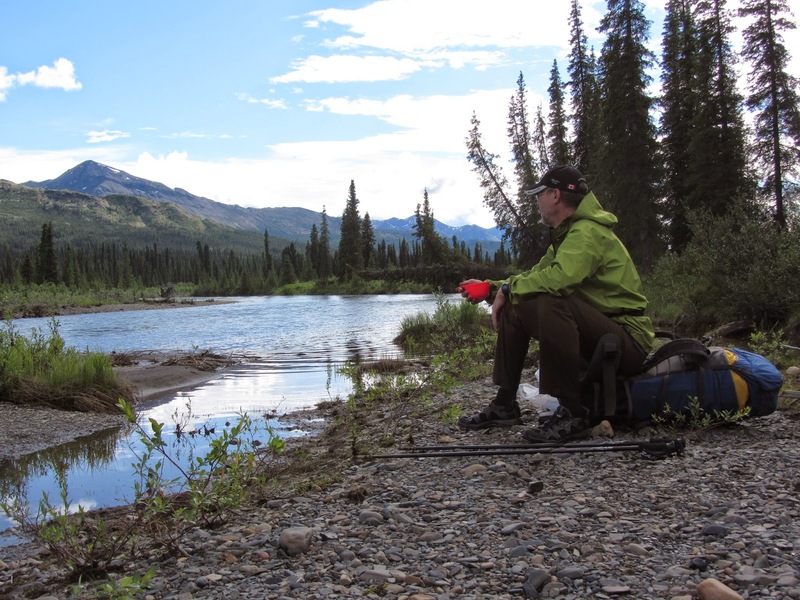 For Brooks Range I have limited myself to one food cache, being placed on the Marsh Fork of the Canning River by Coyote Air who will also transport me to the start of the trek, Joe Creek, close to the Yukon border some 250 kilometers east. This means that I will carry food and fuel for a maximum of 16 days as I start and 14 days after the Marsh Fork cache. The plan is to reach the cache after 14 days and the Haul Road, a k a Dalton Highway, after 25 days. Needless to say I do want some extra food for unforseen extra days. Looking at my base weight right now (the last thing is not said) it will be about 8,5 kilos and the food will weigh around 13 kilos, meaning I will carry some 21-23 kilos as a max. Not that much for a young and strong person and even for me it should be doable. It is roughly what I started with on my Nahanni trek and packrafting trip a couple of years ago. Needless to say the Golite Jam will not hold all this stuff and probably would not be that comfortable with such a weight neither. The pack I will bring is a Hyperlite Mountain Gear Porter Pack 4400 which takes that number of cubic inches and about 70 metric litres. I will add some pockets, including the tent probably, on the outside in order to have some stuff near at hand and also to separate dry from wet gear as much as possible. Weight: 1100 grams. I have used the pack on a couple of trips, in Sarek last fall and on Coast2Coast Sweden recently. For both trips it is much too big and unnecessarily heavy, but I wanted to familiarize myself with it. It is reputedly waterproof, which I have found it not to be, but I never expected that anyway and will as usual keep my sleeping bag and extra clothing in two 13 litre Sea to Summit serious drybags weighing 100 grams each. Keeping my sleeping bag from getting soaked can be a very, very important thing. The pack has worked fine on both trips and currently feels all right (comfortable is probably not a word to be used in this context) with the 23 kilos I am currently climbing the local ski hill on a more or less daily basis. I think this pack will be perfect for the trip. 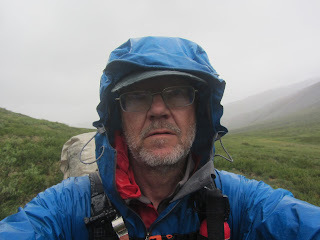 A couple of years ago I spent 8-10 days in very windy and rainy weather along the border between Sweden and Norway, parts along Nordkalottleden, with a comparatively skimpy shelter of my own making. It is not that I was in any danger, but it was a decidedly minimalistic and, in these circumstances, uncomfortable shelter. So I started looking around for a slightly heavier but sturdier and more spacious shelter, since Brooks Range was in my dreams/plans. The shelter I picked and have used along with the HMG pack in Sarek and on Coast2CoastSweden is an MLD Trailstar with a homemade bug-/innertent. The latter is made mostly from Cuben fiber that travelled along Nordkalottleden in another shape, with 500 mm high walls of cuben/silnylon and above that bug netting. Total weight 230 grams and combined with the Trailstar my shelter will weigh about 950 grams including pegs. A very spacious shelter for one and I also feel confident that it will hold up for just about any weather that might occur in the Brooks. Combined weight of the three big ones: 3 025 grams. So, 25 grams extra, but who cares. When I am introduced as a 'gram weenie' I usually counter with: I am not a gram weenie, I am a kilo weenie. Jörgen, I very much like the 3 big ones you are taking, certainly the Porter pack will serve you well and as you have noted they are not waterproof (I would say water resistant is a better term), but there is no doubt as a load carrier it is one of the best. Trailstar, also no doubt about its suitability, interestingly I am using a TT Stratospire 1 in the Swedish-Norwegians mountains this summer and weight wise it is about the same as the TStar inner combo. It will be interesting to compare notes when we next meet. What will be your choice for your new bag? BTW I seem to recall that you said you would never carry more than 20 kg, I must have mis heard you. Have a fun trip and look forward to hearing more. Hi Roger, Regarding sleeping bags the WM Summerlite is high on my list, but maybe it has some equals these days. Any suggestions? No suggestions really, except you may want to look at the BPL.uk down quilts, they look interesting but have no first hand experience with them. Regarding the sleeping bag, I haven't used WM bags so can't compare, but I rate Marmot bags very high. Especially the hoods are the best I've encountered and quality and details are also very good. I have Plasma 30 (Long) as my new summer bag but haven't yet used it enough to really review it. But I'm liking it.